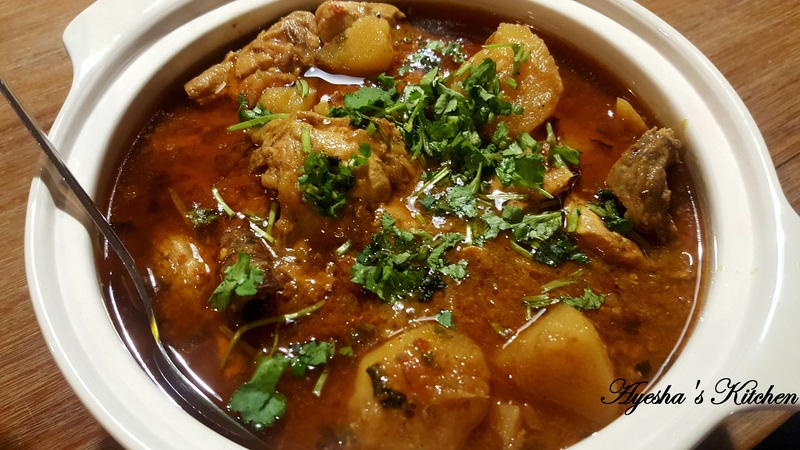 Makhni Karahi is one of the famous dishes of my lovely city, Lahore, (Pakistan) and the beauty of this dish is that it is cooked in 3 – 4 spices, tomatoes and butter and its super easy and super fast. Most of the restaurants serve it with raita (whipped yogurt) and Kachumar Salad (mixed vegetable salad). This is my mum’s favorite dish so on this Mother’s day I want to dedicate this recipe to her……..
-Melt butter in a deep pan and add sliced green chillies, red chilli flakes and ginger. Fry until ginger gets a nice golden crusty colour. -Add chicken pieces and all the spices. Fry for 10 minutes or until the chicken is golden. Add chopped tomatoes and cook it covered on medium heat until the tomatoes are mixed and chicken is tender and it gives a thick masala like texture. -Dish out, garnish with 2 green chillies and coriander. 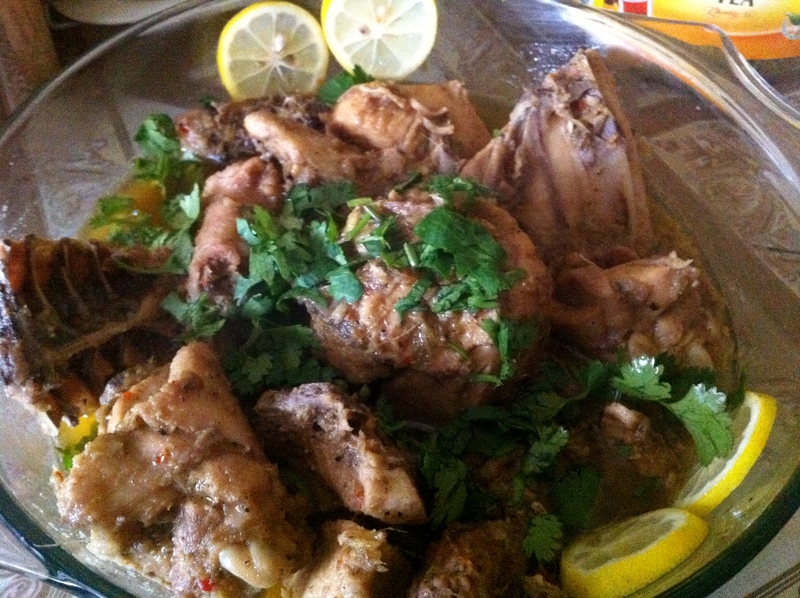 -Serve hot with kachumar salad and roti. 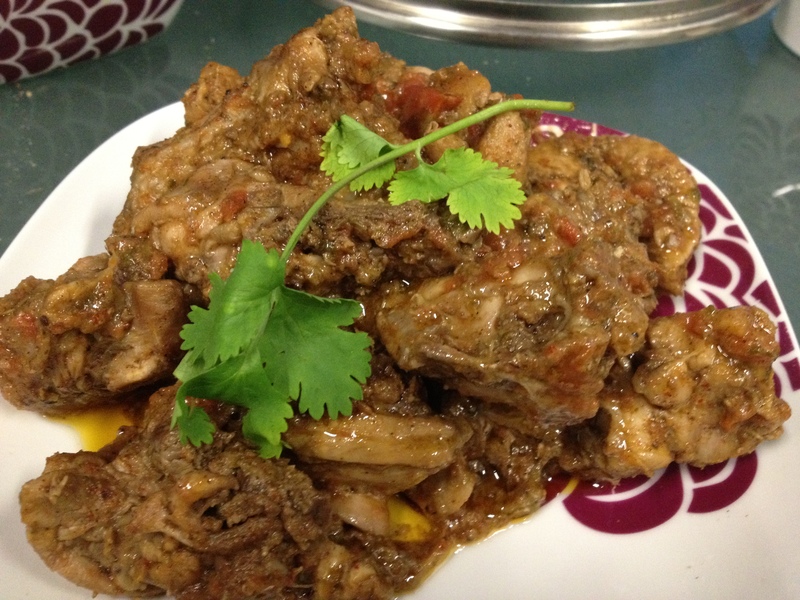 Another way to make Chicken Kadai …………..
-Combine crushed green chillies, ginger, garlic, coriander, salt, red chilli powder and garam masala in a bowl and mix with yogurt. Add lime juice. -Heat oil and fry chicken until it is fried and slightly golden. -Now add the yogurt paste and mix well for 2 minutes on high heat. Add tomatoes and let it cook covered for at least ½ hour on low medium heat. -If the oil comes up that means it is done, otherwise cook of high heat, with constant stirring until the water evaporates and oil comes up. Remove from heat. -Meanwhile, put a piece of charcoal on high flame and heat it until it is white and hot. -Now place a 4×4 piece of aluminum foil on cooked chicken and place the coal on it. Drizzle some oil and cover it with the lid. -Keep it aside for at least 15 minutes. Serve hot with raita, salad and chapattis. 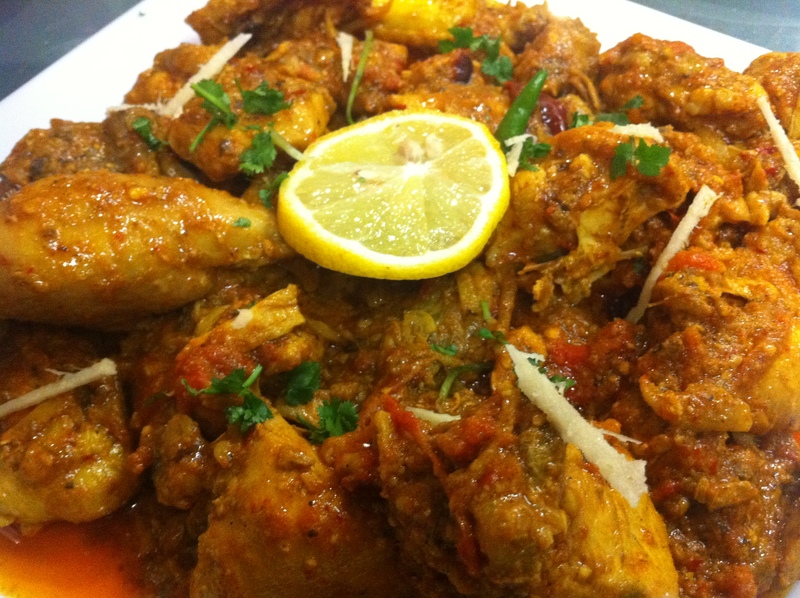 Chicken Karahi or kadai is one of the most famous dishes in Pakistan. It is as famous as fish and chips in London and Pizza in Italy. 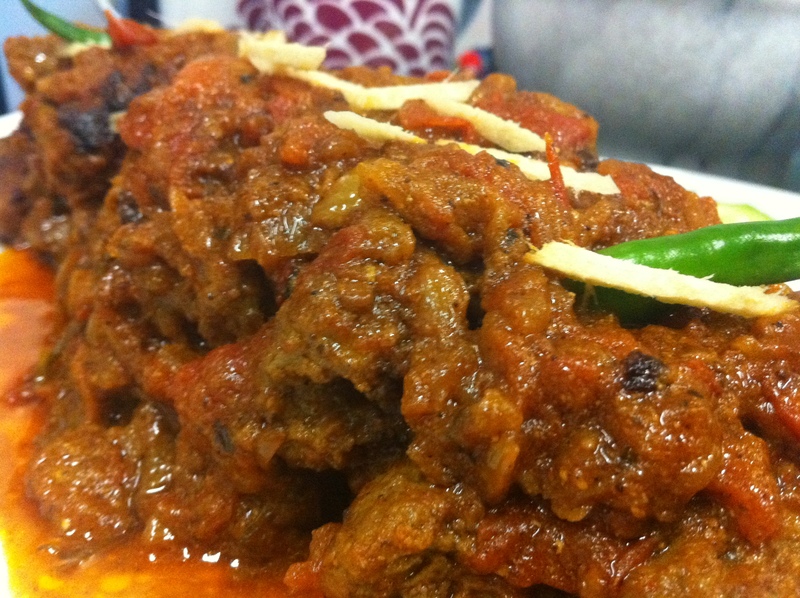 A tasteful, aromatic dish cooked in tomato gravy and some nicely blended spices. Do try this and make your day ……. -Heat oil and fry ginger juliennes and minced garlic, until they are red. Now add chicken and cook on high heat, with constant stirring until it turns white. Now add garam masala and mix well. -Now add all other spices, except methi leaves and mix well. -Add tomatoes and yogurt and cook covered on low medium heat for about 10 minutes or until the oil separates from the masala. Now add methi leaves, give it a last stir and remove from flame. -Take it out in the serving dish and garnish with some lemon slices, coriander leaves, ginger julienne and green chilllies. 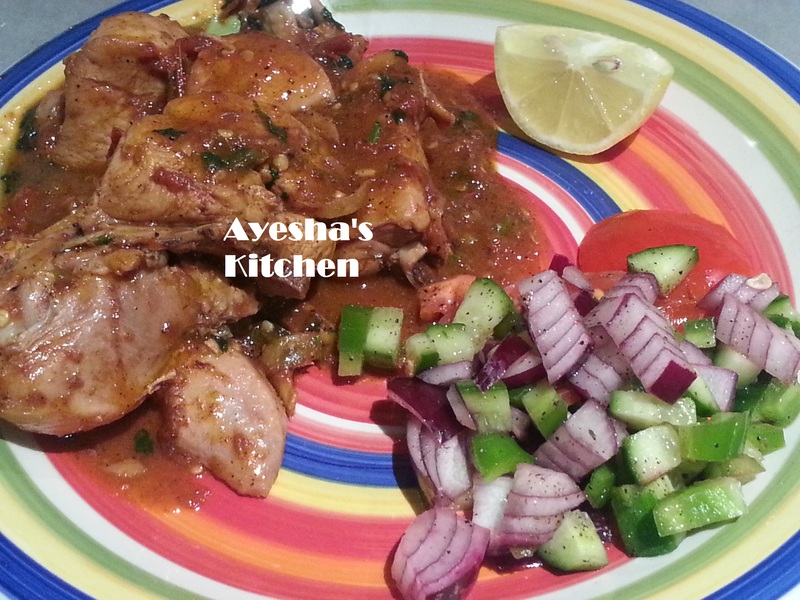 -Serve hot with raita, fresh salad and roti. 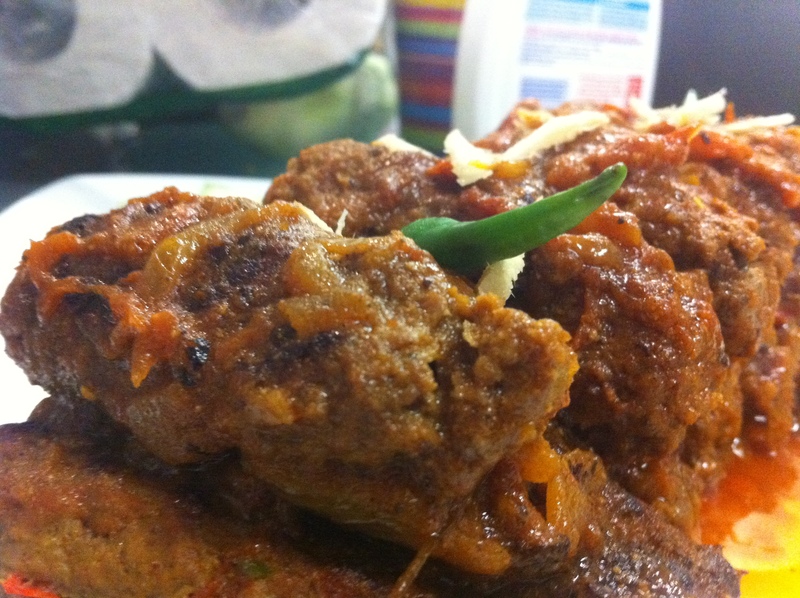 Kabab Kadai is a Pakistani – Afghani dish which is not so famous in Pakistani restaurants but is now introduced in home cooking. I make this dish quite often for fancy dinner parties and my guests always appreciate it. 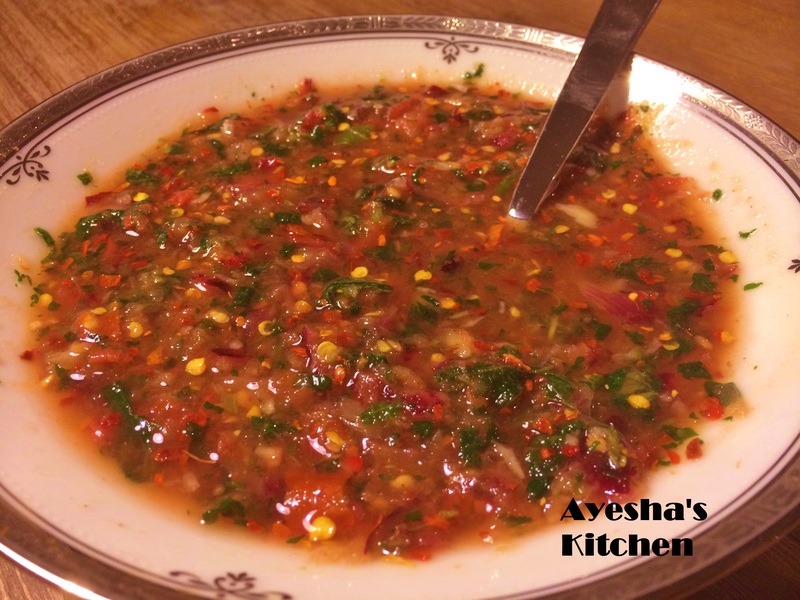 Do try this and feel the taste of Ayesha’s Kitchen …..
-Put a piece of charcoal on fire. -Combine everything (spices and vegetables) given for kababs in food processor (chopper) and mix well. -Glaze the grill pan with some oil and place the kebabs on it. Cook on medium heat until they are done. -Take them out in a casserole dish or pyrex dish and place a 2X2 aluminum foil on it. Place the hot white charcoal piece on the aluminum patch and drizzle some oil on it. It will start smoking. Immediately cover it with a heat conducting lid and keep aside until we need it again. -Heat oil in a pan and fry chopped onion and ginger garlic paste until the onions are light brown. Add spices, yogurt and tomatoes and cook on high heat with constant stirring until the tomatoes are cooked. Add a splash of water if necessary. -Now add all the spices and check for the salt and pepper. Adjust if needed. -Add some water (about ½ cup) and mix well. -Now add your kababs and cover the pan. Cook on very low heat for 10 minutes. -Dish out and garnish with some coriander, green chillies and ginger julienne. 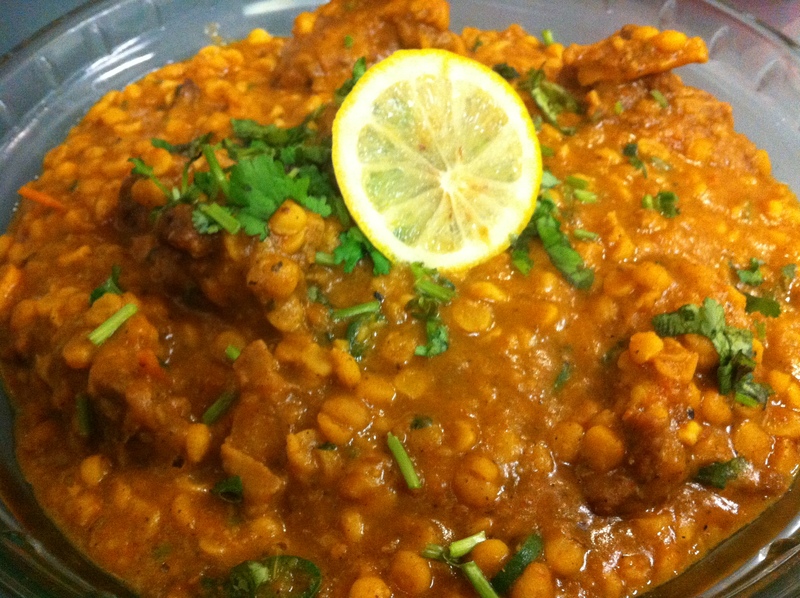 -Serve hot with raita, fresh salad and tandoori roti. 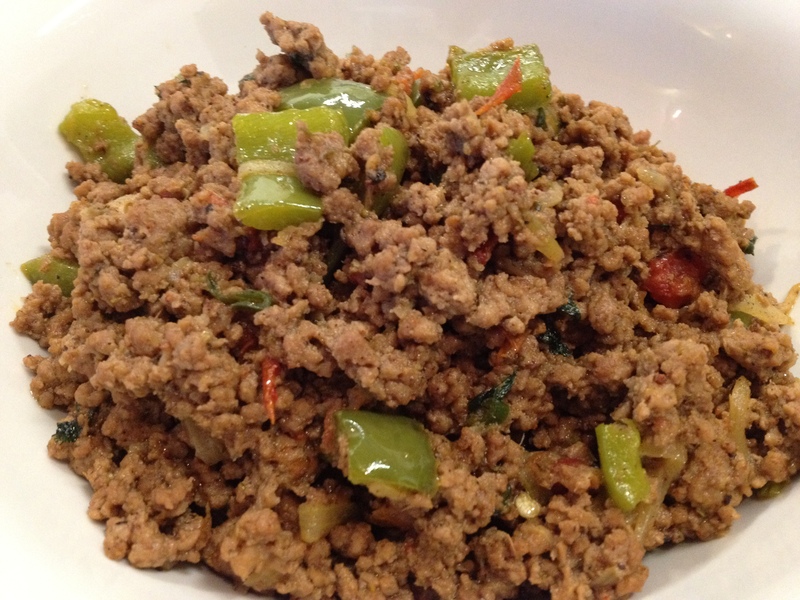 -Marinade meat in vinegar and meat tenderizer (best meat tenderizer is green papaya paste) for 12 – 14 hours. 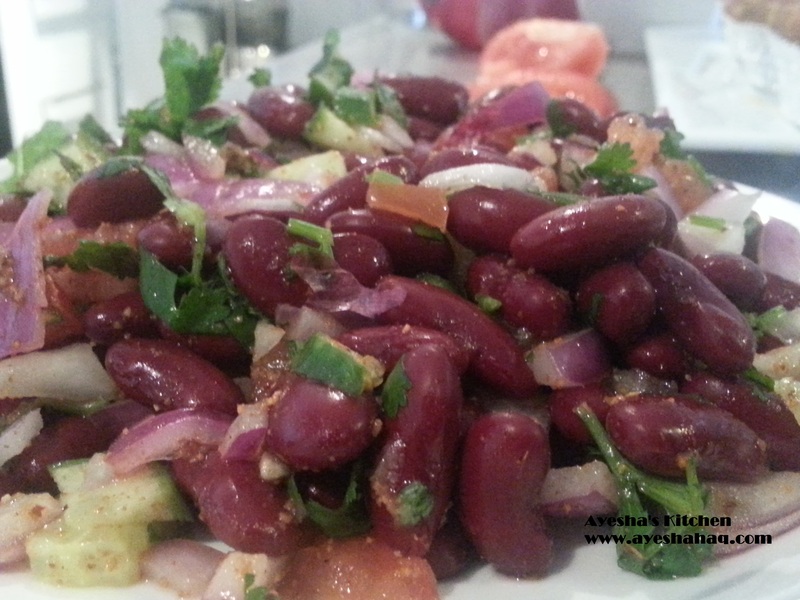 -Heat oil in a deep pan and add onions and whole garam masala and fry until onions change their color. Now add lamb pieces, turmeric and ginger garlic paste. Stir fry for 10 minutes. Now add salt to taste on low medium heat cook the meat. -When the moisture vanishes and oil comes up, add yogurt and tomatoes and other spices except black pepper and cook on low heat until it takes a form of masala. This process will take approximately 20 minutes. -Now add black pepper and stir. Take it out in a dish and garnish with garnishing ingredients written above. 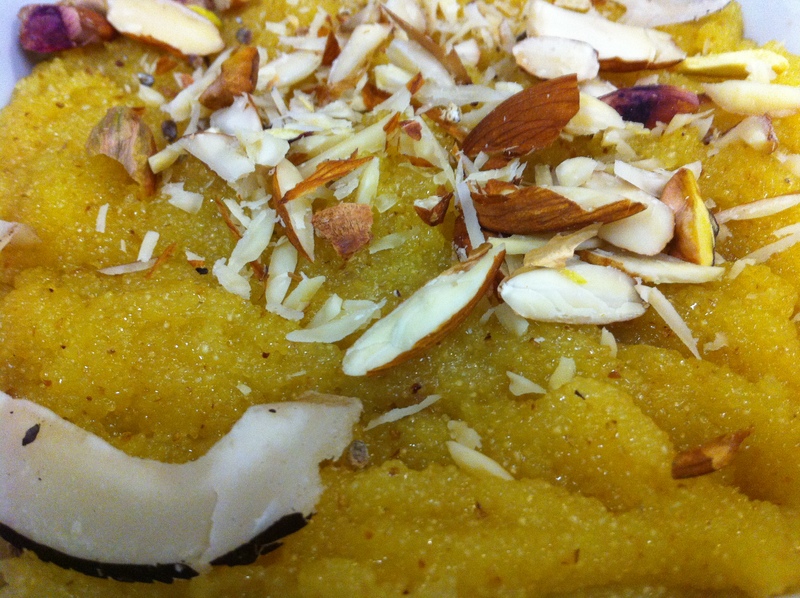 -Serve hot with naan bread or tandoori roti. 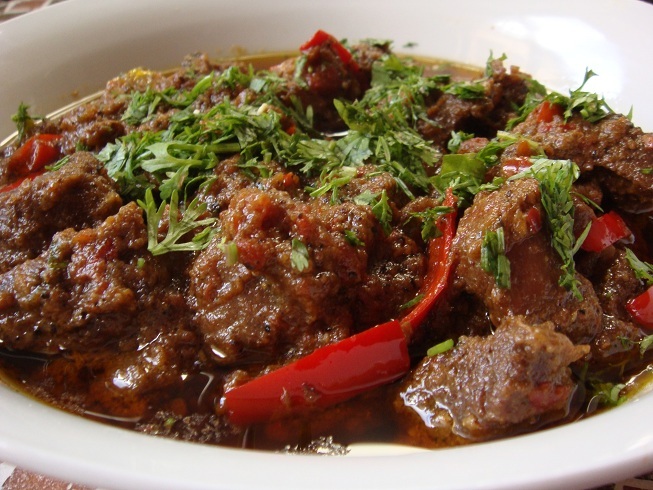 Tasty and aromatic mutton karahi is ready to serve.